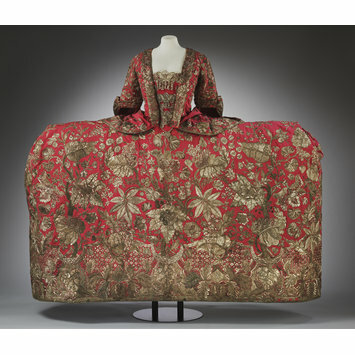 This is a magnificent example of English court dress of the mid-18th century. It would have been worn by a woman of aristocratic birth for court events involving the royal family. The style of this mantua was perfectly suited for maximum display of wealth and art; this example contains almost 10lb weight of silver thread worked in an elaborate 'Tree of Life' Design. The train is signed 'Rec'd of Mdme Leconte by me Magd. Giles'. The name Leconte has been associated with Huguenot embroideresses working in London between 1710 and 1746. The Huguenots were French Protestants who, following the repressive measures against them that the Catholic monarch Louis XIV of France restarted in 1685, emigrated to Britain and elsewhere. A woman's court mantua composed of mantua and petticoat of dark pink ribbed silk, embroidered to shape with silver thread, strip, frisé, purl and spangles in a large Tree-of-Life design. The mantua is open at the front with double-pleated robings to the waist and elbow-length sleeves with deep, pleated cuffs. The back is made of one width of the silk, pleated and shaped to form the back of the bodice and extending into the train. On either side of it, below the waist, is a tapering rectangle made of 3 pieces of silk, to form the gathering of the mantua at the back. The upper piece also forms the bodice fronts, one pleat of the robings extending into one of the pleats at the back. The bodice is lined with linen. On the side seams below the waist on the inside are two loops of silver cord, with corresponding silver buttons on the right side, for draping the mantua. The mantua is embroidered to shape, the bodice, sleeves and cuffs, worked and scaled to accommodate their pleats and shaping. The train and its side panels are worked on the wrong side (relative to the bodice), but to show correctly when the mantua is properly arranged. The petticoat is made of 7 widths of silk, embroidered over 6 seams, with the final seam after embroidery at the right back. There is an opening in the middle of the centre back panel. The petticoat is lined with red silk taffeta and the hem bound with a woven silver lace (braid). Its original shape was probably for a wide, square hoop. It is embroidered in a symmetrical Tree-of-Life design with scrolling stems and large leaves originating from a dense swag and lattice border at hem, pattern opening up as it reaches the top. Some embroidery done originally in coloured silks, then covered over with silver thread. The mantua was altered for fancy dress in the 1920s. The robings were reconfigured and a cut dart (now removed) added to the waist on each side of the front. The corners of the train end were narrowed. The waist binding was removed from the petticoat, the pleats undone to lengthen it and reconfigured for a round shape. Conservation was carried out after acquistion for display 1982-2001. 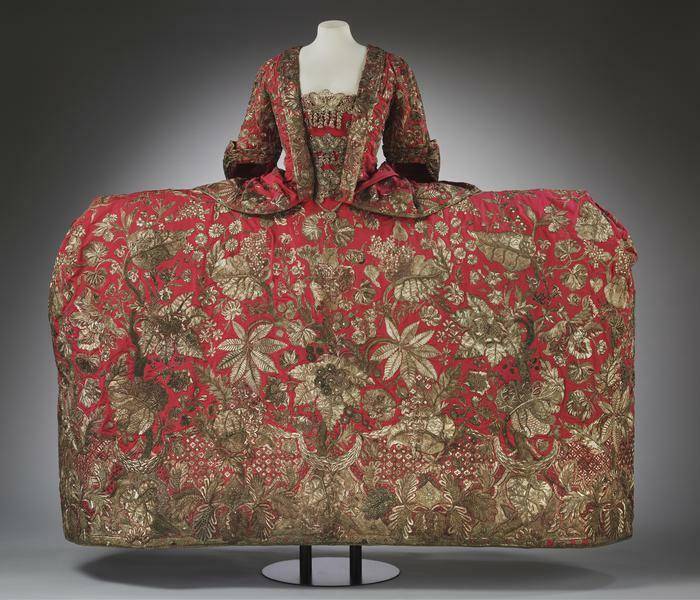 The waist of the mantua was re-inforced, and matching silk added to missing parts of train. Matchingsilk added to petticoat at waist, and waist reconfigured for a square hoop. Purchased by Annie, Lady Cowdray from Reville in the 1920s for a fancy dress ball. No prior record of the ensemble. Historical significance: This is the V&A's finest example of 18th century women's court dress and unique in its markings by embroiderer and dressmaker. 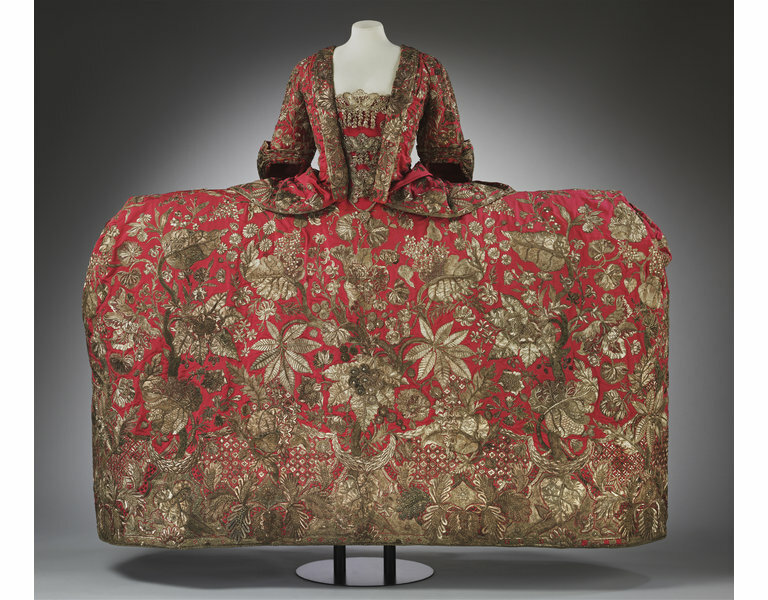 The dense heavy pattern of the embroidery indicates early 1740s and possibly the influence of French rococo design. This represents court dress, the most formal of English 18th century dress. It would have been worn by a woman of aristocratic birth for attendance at court.